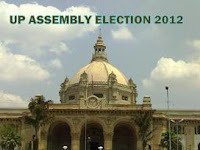 Uttar Pradesh Assembly election's Phase II polls for 59 seats in 10 districts would be held on Saturday that will decide the fate of two state presidents, 31 MLAs and 24 former ministers. More than 1.92 crore voters are expected to cast their votes to seal the fate of 1098 candidates in the polling to be held in Sant Kabir Nagar, Maharajganj, Gorakhpur, Kushinagar, Deoria, Azamgarh, Mau, Ballia and Ghazipur amidst tight security. Stakes are high for ruling BSP, Congress, SP and the BJP in the no holds barred fight for the 403 assembly seats. The voters will cast their votes at 20425 polling booths at 12995 polling centres. The second phase would seal the fate of many senior leaders, including speaker Sukhdeo Rajbhar, Revenue Minister Phagu Chauhan, state presidents of BSP and BJP, deputy leader of SP Ambika Chaudhary, 31 MLAs and 24 former ministers. Vidhan Sabha Speaker Rajbhar is in fray as BSP candidate from newly-created Deedarganj seat in Azamgarh district, whereas deputy leader of SP in assembly Ambika Chaudhary is seeking rerun from Phephna in Ballia. Prestige of state presidents of BSP and BJP is also at the stake in this phase. While BSP state president and cabinet minister Swami Prasad Maurya is contesting from Padrauna seat in Kushinagar, BJP state president Surya Pratap Shahi is trying his luck from newly-created Pathardeva seat in Deoria district. Former BJP state president Ramapati Ram Tripathi is in fray from Siswan seat in Maharajganj district, whereas Revenue Minister Phagu Chauhan is contesting from Ghosi seat in Mau district.